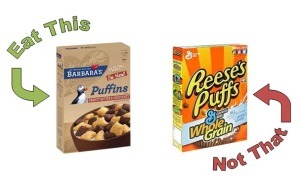 They share the same ¾ cup serving size, but Puffins have half the sugar, three times the fiber, and 1/3 the fat of that other peanut butter and chocolate cereal. Puffins also have more calcium, vitamin D, and vitamin C. Fiber fills you up and the sweet taste keeps a smile on your face. One 6-oz. 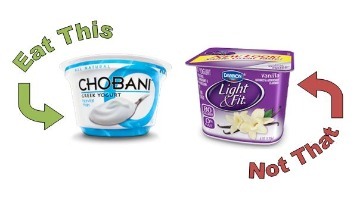 single serve cup of plain Greek yogurt has three times the protein and almost half the sugar of Dannon Light & Fit. Protein gives this choice staying power to help carry you through your morning and stave off the hunger pangs until lunch. Watch out for fruity yogurts though, they tend to have a hefty dose of added sugar. Yes, eggs have gotten a bad rep in the past, but the latest research is showing that eating the yolk may not actually raise cholesterol levels. 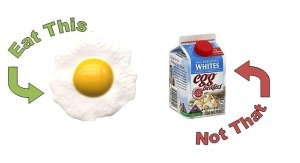 You don’t have to eat the yolk every time, but consider keeping them a couple of times a week. The yellow part of the incredible, edible egg contains choline which is important for brain function, folate, iron, vitamin D, and calcium which is not present in the whites. A typical bagel is the equivalent of eating 5 slices of bread. Bagel thins cuts out a lot of the filler and still leaves you with a great vehicle to enjoy spreads like cream cheese and fruit preserves. 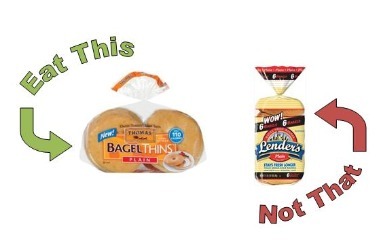 Thomas’ Bagel Thins also have twice the fiber and half the sugar of regular bagels and cuts the calorie count in half. Fresh or frozen fruit is always a good addition to get your morning boost. They’re packed with antioxidants and vitamins that help co-eds feel vibrant and defend against illness. Have a glass of low-fat milk instead of whole milk or add soymilk to your morning cup of coffee instead of creamer. Small changes lead to big results. College Lifestyles is an online magazine bringing nutrition, etiquette, and lifestyle to the classiest of co-eds.